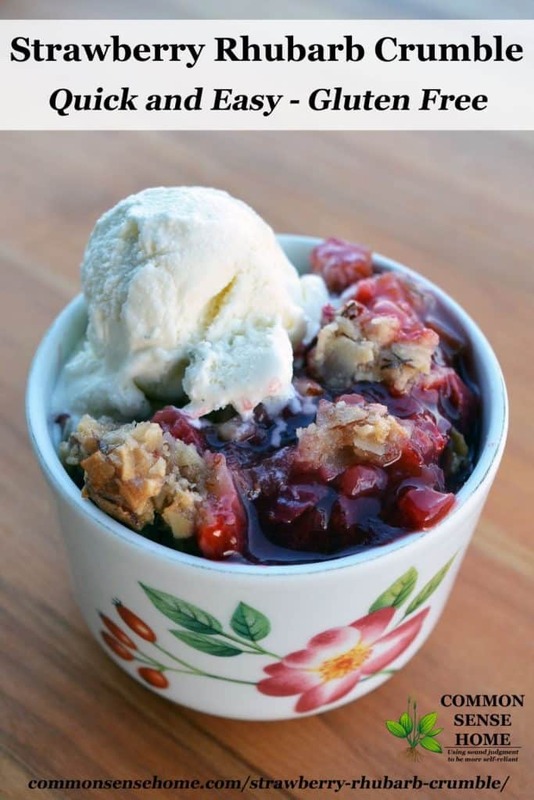 We enjoy this strawberry rhubarb crumble hot or cold, plain or with a scoop of ice cream or a dollop of vanilla yogurt. Last time I made up a batch, I shared one of the photos with my friend, the divine Miss MaryJean, and she was inspired to pop over for a visit and give it a try. She said it was worth the drive. I hope you enjoy it, too! This crumble topping also pairs well with most other seasonal fruits or fruit combinations. Note – you can visit our rhubarb growing guide for help with your patch. 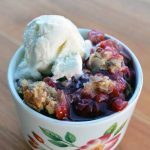 The terms “crumble” and “crisp” both refer to baked fruit desserts with a streusel or granola style topping that are a combination of flour, sometimes nuts or oatmeal, butter and sugar. Crisps originally referred only to those that contained oatmeal, but now the terms are often used interchangeably. 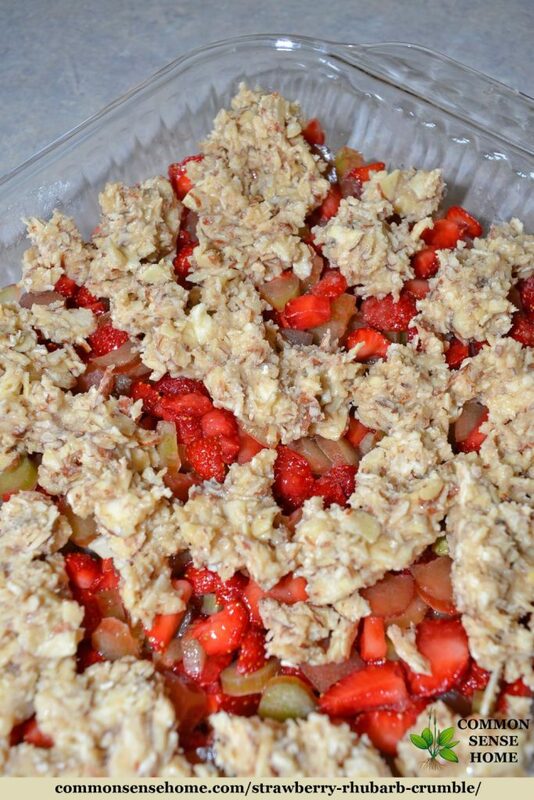 Combine chopped rhubarb and strawberries in a 9″x13″ baking dish. I prefer to use a glass baking pan because it is non-reactive. In a separate bowl, mix together sugar, cornstarch and almond extract. Pour sugar mixture over fruit, mix to coat. Combine almond, gluten free flour, coconut and cinnamon in a medium bowl, mix well. Cut in chilled butter using a pastry blender to form pea sized lumps, or smash together with your fingers. Add in honey and blend well with by hand. Evenly distribute clumps of topping over the fruit filling. Bake at 350°F for 35-40 minutes, until evenly browned and center is gently bubbling. Let cool for about 15-20 minutes before serving (if you can wait that long – this smells sooo good in the oven). 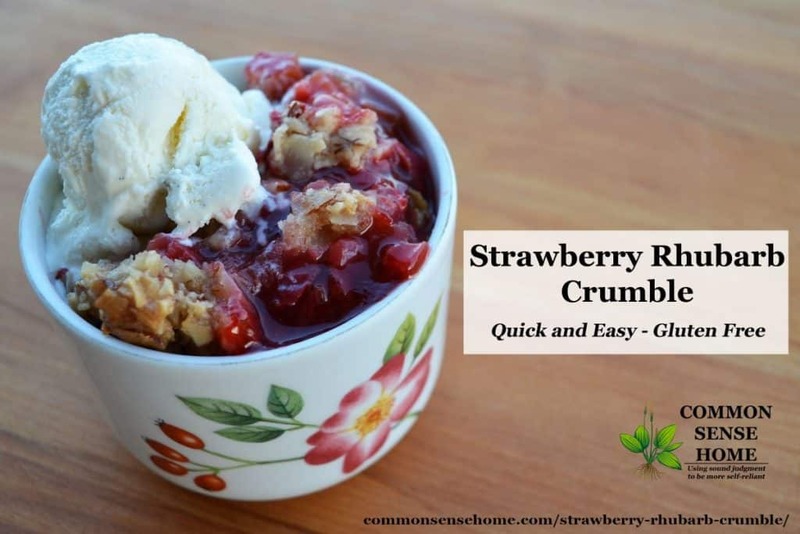 Strawberry Rhubarb Crumble – Enjoy this seasonal combination of fruits fresh or frozen. Goes together in minutes, gluten free, sweetened with honey. Combine almond, gluten free flour, coconut and cinnamon in a medium bowl, mix well. Cut in chilled butter using a pastry blender to form pea sized lumps, or smash together with your fingers. Add in honey and blend well with by hand. Evenly distribute clumps of topping over the fruit filling. Bake at 350F for 35-40 minutes, until evenly browned and center is gently bubbling. Let cool for about 15-20 minutes before serving. 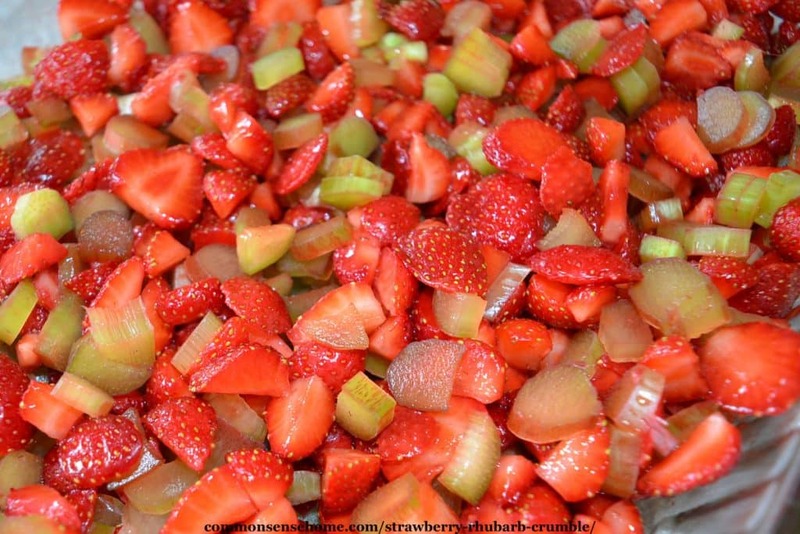 What's your favorite strawberry-rhubarb combination? Do you have a favorite rhubarb or strawberry recipe? Please share – I'm always looking for new ideas. Another favorite of mine is strawberry rhubarb jam. 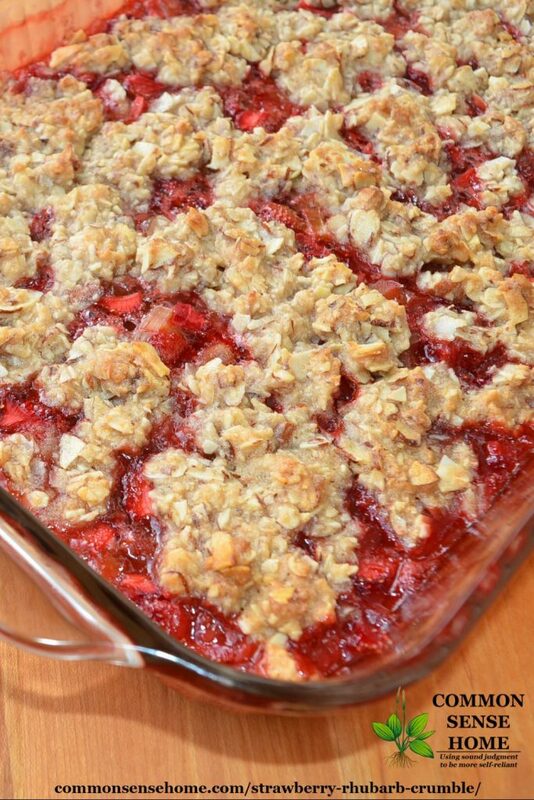 PS – If you try the strawberry rhubarb crumble recipe or another fruit combination, let me know how you like it! Originally published in 2011, updated in 2016, 2018. Oh this looks good! I'm stopping by from Fight Back Friday where I shared my Fresh Mex Flatbread Pizza. I LOVE rhubarb, and though I don't have gluten issues love that you made it gluten free! Yum!! Bookmarking it now. Thanks!! Thanks for following, Denise. 🙂 I'll have to take a peak at your pizza. I'm, not completely gluten free, but I'm trying to move that direction. I'd like to cut the sugar in this, but rhubarb is so tart that I'm not sure how one would do it and get a similar product. Oh this looks so delicious. Strawberries. Rhubarb. 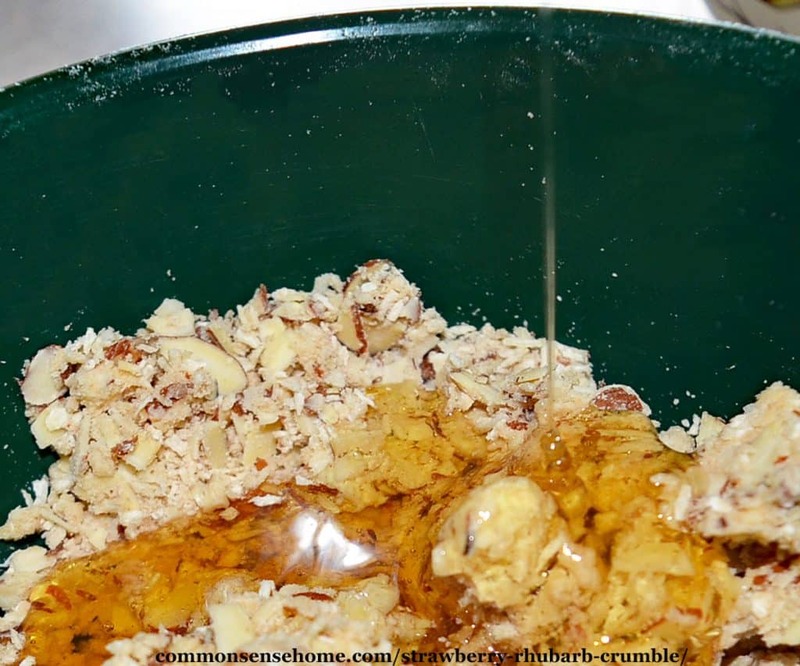 Crumble…. What a combination! After seeing so many examples of phonetic spelling and confusing punctuation, I can’t tell you how happy it made me to see you use i.e., correctly! Brava!